When money is tight, the inevitable searches for easy savings ensue. There are, of course, a great many methods you can use to minimise your outgoings on your finances; a number of these are covered in guides elsewhere on this site. However, aside from keeping down your credit card bills, there are plenty of other ways you can save surprisingly large amounts. The regular trip to the supermarket can be a hellish ordeal if you are watching the pennies. Either way, though, it will likely constitute one of your major expenditures over the month. As a result, this should be one of the first areas to which you look to cut costs. It is, in fact, very easy to save money while shopping. One of the most important factors to consider is the time of day at which you are making your visit. You should always shop just before closing time in a supermarket, as fresh produce such as bread and meat is often marked down for a quick sale. 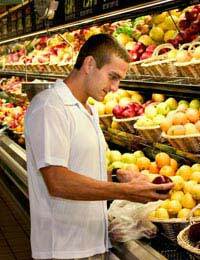 As fresh food is often the most expensive to begin with, you can make substantial savings this way. On the other hand, however, don't be drawn in by offers or promotions. Of course, these can present large savings when offered on basic items, but this rarely happens. It is easy to buy reduced items, thinking that you have found a bargain. However, if you weren't going to buy the items in the first place, it is a false economy. Of course, supermarkets are designed to make you buy as much as possible. You will be guided around aisles of luxury items before you can get to the bread, for example. As a result, you may find it cheaper (and easier) to shop back to front: start at the far end of the store and work your way back. If you have local access to a market, you should make the most of this. Everyday items such as fruit and vegetables are generally far cheaper here than in supermarkets. However, don't over-buy - as comparatively cheap as it is likely to be, 'stocking up' on items which will go bad before you use them is wasteful. There are many other ways of making shopping easier to pay for. Some supermarkets still offer shopping stamps, through which you can spread the cost of your shop. This may be particularly useful if, for example, you draw a pension. There are some more contemporary alternatives, however. Store loyalty cards (not store cards) can offer excellent returns simply by using them when you shop. Although the number of points you are accumulating may seem pitifully small at the time, they quickly mount up. If you can use your card when you buy items such as petrol, you will quickly find that your points will pay for entire shopping trips. The key to economical shopping is to buy only what you need. As a result, one of the best things you can do is to make a list before you leave the house, and ensure that you stick to it. Similarly, shopping with young children is a recipe for financial disaster; shop sensibly, and shop out of supermarkets, and you can make excellent savings.